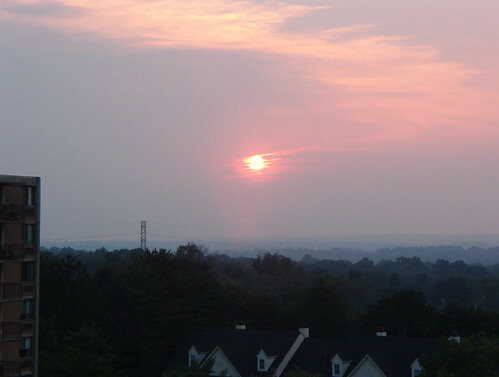 Sunset viewed from the balcony of my old apartment in Plymouth Meeting. Today’s collection of words is a bit random, but I hope you’ll bear with me. I realized that in my post on Ramadan I didn’t provide the French for sunrise (le lever de soleil) and sunset (le coucher de soleil). It always makes me think of the sun going to bed at night and getting up in the morning—cutesy, I know, but there you have it. A sunbeam, by the way is un rayon de soleil. One of the people I follow on twitter used the word une sacoche, which can refer to any kind of large bag, from a large purse or satchel to saddlebags or panniers on bikes. Un panier, with just one n, is a basket, including in basketball (le basket-ball or just le basket).